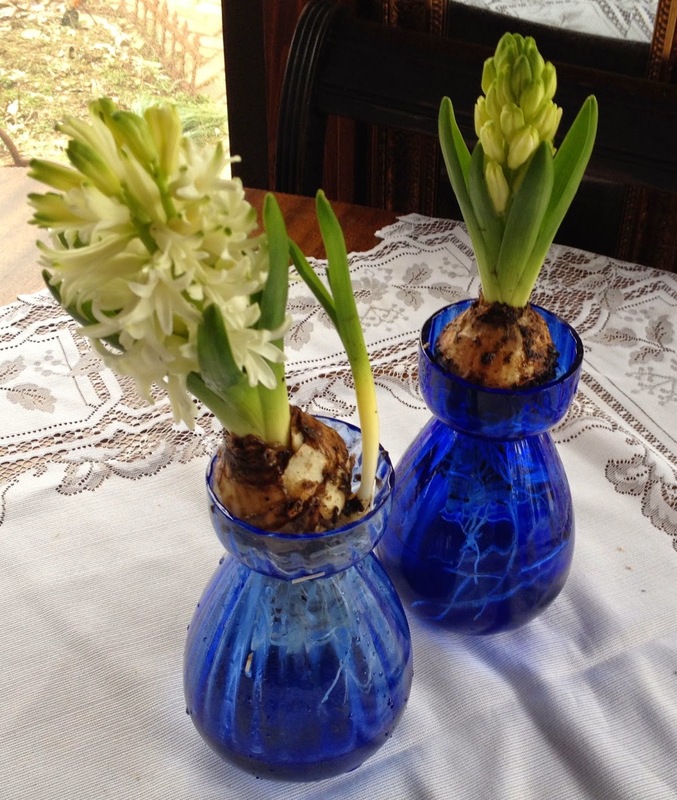 Lines from Linderhof: Hyacinths For Spring! 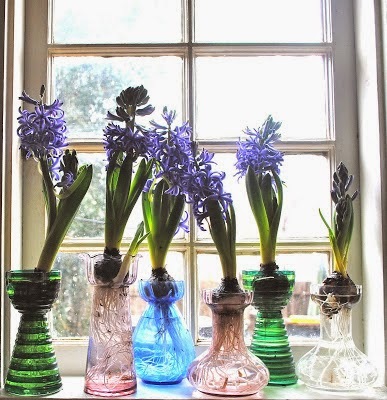 For years and years, I've collected Hyacinth "glasses" (Victorian term) or Forcing Vases (modern term). They're rare as hens teeth here. If I find one every two years, I feel like I have hit a "mother lode" or a "treasure trove"! But every once in a while, you'll find one. Usually marked as a "vase" because the seller doesn't really know what they have! In an antique shop. How my mouth drooled. But I had promised myself "nothing breakable" and so I passed all of these treasures up! And reasonably priced as well! Some years, I buy more bulbs than other years. (As I often do with the paperwhites). With my attention span of a gnat, I forget from one year to the next how many I want or used the last year! I usually favor one color as well. But that's just me. I love the purple ones and I think they are the most fragrant, but I like the white ones as well -- they are pure and stunning! The pink is probably my least favorite, although in a couple of my "pinky" glasses, they do make for a pretty picture! My favorite hyacinth year was this one. When I used different colors of glasses but all purpose hyacinths! In the kitchen window, with the sun streaming through the colored glass . . . and the fragrance of those hyacinths wafting through the house . . .
At the time of that picture, that was ALL of my hyacinth glasses. I've since found a couple more -- here and there! This year, I have but a mere two . . . white ones . . .
And I chose my blue "glasses" to force them in. One from the picture above and the other found last summer at an antique mall just outside of Wichita. At first glance, they look alike (the hyacinth glasses) but the newest one is thicker glass and so looks like a deeper blue! Every once in a while, I think I should have been a purist and just collected one color of glass. Alas, if I had done that I'd only have about three by now! Instead of the eight or so that I do have! And I refuse to look on eBay for the glasses. You can find them there easily! And for not a lot of money. But it's more fun, I think, to occasionally come across them at flea markets and antique malls! This year, it's white flowers in blue vases. They'll set a pretty table with my blue and white transfer ware! Looking good! My hyacinths are blooming like crazy too. I have some in bowls with glass pebbles holding them up. I have my eyes open for bulb vases now. If I see them, I'll get them. Thanks for sharing your photos. I love all the colors. I have purple ones in my garden, but they aren't blooming much this year. They look pretty sad. Others I planted in pots have not appeared, so perhaps they won't. I have never seen such glass as you are showing us today. How very pretty they all are. I rather like the mix of colors myself. I will have to take a peek now and then and see if I can find one myself. Beautiful as always! You have a lot of those vases. I got one with the hyacinths that I bought a couple of months ago and when the hyacinths bloomed it was so heavy that it kept falling over so I had to put it in a pitcher! Any advice? Take care and happy Saturday! Found one at an estate a couple years back for only $2 but I stupidly left it because I had bought so much already. =( Love your collection.